Over the past 25 years or so I've spent a fair amount of time poking about in the Bob Marshall Wilderness Area , partly because it's my backyard, and partly because it's a large place with no roads and motorized gizmos tearing up the landscape, the soundscape, and the nosescape. 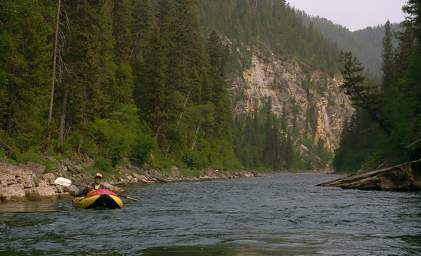 Most of that exploration has been on foot and horseback, but as a long-time kayaker and sailor I've always wanted to float the South Fork of the Flathead River which runs north through the Bob. I should have done it long ago but somehow the stars didn't line up right. In late May I got an email from my crazy fishing trip buddy, Wayne, with the subject line "Need Adventure". We sifted through various ideas and the South Fork came out at the bottom. 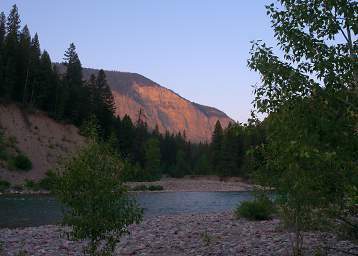 The South Fork originates in the southern part of the Bob Marshall Wilderness Area and flows north for some 60 miles. There it enters Hungry Horse Reservoir, a 34 mile long empoundment behind Hungry Horse Dam. 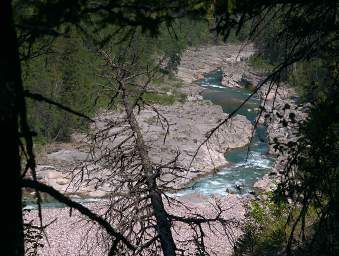 Below the dam it runs for five miles before joining the Middle Fork of the Flathead to form the main Flathead River. Our goal was to float down Young's Creek to its confluence with Danaher Creek, where the South Fork proper begins. I'd wanted to do that ever since the first time I saw Young's Creek back in 2006. That was in August, and back then Young's looked a bit scratchy but still floatable. 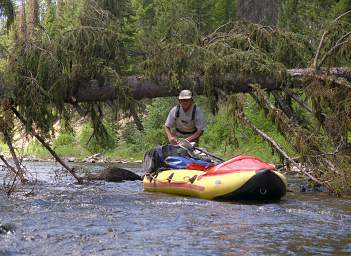 I knew there would be some issues with logjams and portages, and I'd heard something about some rapids, but I knew it had been floated before and any bad spots were portageable. If you looked at the historical hydrograph, you'd be unwise to plan a trip down the South Fork for the end of June and early July; it's still normally running around five thousand cfs after peaking a few weeks earlier. 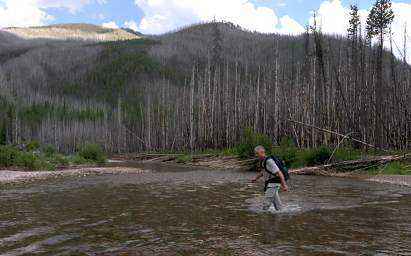 But this was a particularly dry year and all the rivers around here were peaking early. The North Fork of the Blackfoot was a month ahead of schedule, and judging by the real-time hydrograph the South Fork of the Flathead looked to be doing the same. By my guestimation we should hit Young's Creek and the South Fork just about right. My original plan was for me to pack in our gear while Wayne hiked in. I'd spend the night and then bring the horses out the next day, take them home and turn them loose, then hike back in. Wayne could be exploring around and fishing while all that was going on. Then I got a better idea; I'd hike in with Wayne and lead the two pack horses, and a friend could ride in and lead them back out. That didn't pan out due to schedule conflicts. Then the Forest Service closed our intended access up Lodgepole Creek and down Jenny Creek for trail repairs, which meant we would have to go in over Pyramid Pass, a slightly longer route. My two Belgian-Arab crosses died some years back, and we now have only three horses -- two saddle horses and one Halflinger (Scheba) who's our pack horse. I figured I could also pack Dona's saddle horse (Sky), but I'd never done that before and wasn't sure how much she could carry; she's a small horse. So I was a little apprehensive of my plan without having any experience to go by. 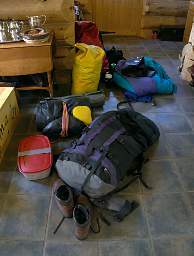 I wasn't worried so much by the weight of our gear, but I was worried about fitting it all on those two horses. Sky can't carry nearly the load that Scheba can. After hashing options over with Wayne, we decided to have Jack Rich at Rich Ranch pack in our gear. It would save the hassle of me going in and out and back in, give us extra time on the trip itself, and avoid potential screwups in my estimating and horse-wrangling operation. We would hike in the same day Jack packed in our gear. We were limited to 175 pounds each, the amount one of Jack's mules could carry; we figured that shouldn't be a problem. This page last updated on 2015-07-16.